What’s been happening at Small Bites by Jessica, plus this week’s Menu Plan Monday, and links I loved over the past two weeks. Hope everyone had a wonderful Labor Day Weekend! I know for most of you with kids, school has started, but my girls have one more week off before their last year of nursery school begins. I’m definitely not one to rush away the summer, but it sure seems like they’ve been home for way too long! I’m anxiously awaiting their school to begin for two main reasons: (1) This is the first year they will be in separate classes. While I’m excited for them to become more independent and have their own unique experiences, I’m nervous about the adjustment, especially socially. The trials and tribulations of being a #TwinMom. (2) While I’m prepared to pack them lunch everyday (surely you’ve seen my Healthy School Lunch Ideas post), it’s one more item to add to the to-do list, one which seems never-ending as it is. There’s a little peek into some of what’s occupying my brain these days. In other news, have you started receiving my Nutritious Food, Delicious Life newsletter? If not, sign up now for weekly emails with my latest nutritious and delicious recipes, family-friendly nutrition tips, and more. You’ll never have to worry about missing a post here! 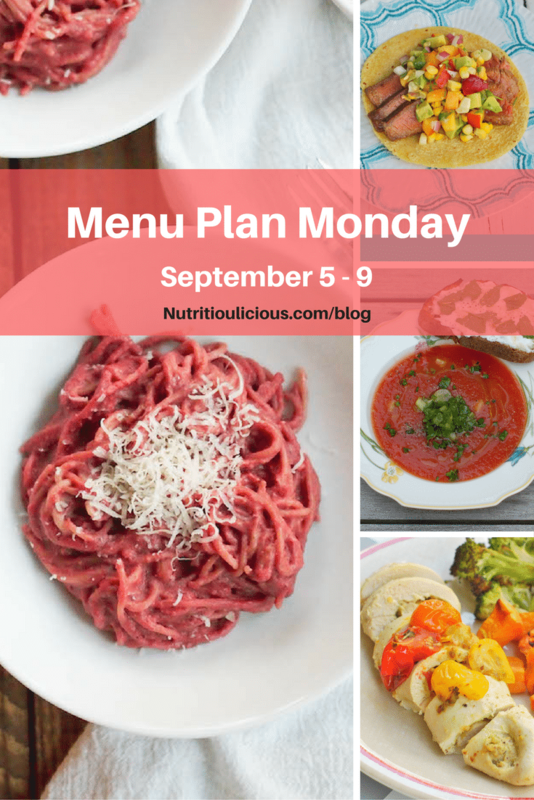 Now, onto this week’s Link Love and Menu Plan Monday. There are lots of great articles and recipes below since I missed posting last Monday, so be sure to look through and see what catches your eye. I can assure you you’ll find something you enjoy! As for this week’s menu, we’re having company Friday night, so it’s a bigger meal than usual. Trying to make the most of what’s left of the delicious summer produce! ⇒ This is my favorite in the series thus far. Just check out my comment on the blog post and on their FB post to see why! ⇒ Navigating the supermarket isn’t easy – even for RDs sometimes! Get some great tips from my friend and fellow RD Rebecca from Nourish Nutrition Co.
⇒ This emulsifier/stabilizer ingredient is hard to pronounce, but that doesn’t mean you should avoid products with it. Find out more in this great post. ⇒ Excellent tips for avoiding the infamous weight gain that comes along with starting college. Check out what I have to say about navigating the all-you-can-eat cafeteria! ⇒ Oh how I can relate to Jenna’s roller coaster ride trying to teach her boys healthy eating habits. Dietitians aren’t exempt from these struggles, but we do our best to get through them and hopefully these tips will help you with your kids! ⇒ I don’t think parents can ever have enough ideas for filling the school lunchboxes! I love that Sally breaks down the ideas by food groups, snacks, and foods that go well in a thermos. ⇒ Both components of this recipe look amazing. Can’t wait to try them together and separately! ⇒ I love a grown up PB&J and this one looks amazing! Can’t wait to try it out! ⇒ You know I love corn and black beans together! Just see here, here, and here! Can’t wait to make these tacos! Healthy Greek Yogurt Brownies @ Joy. Food. Sunshine. ⇒ I love baking with Greek yogurt (have you seen my Chocolate Pear Bread?) and I’m excited for another use for almond flour too! ⇒ Need more recipe ideas for all those end-of-summer tomatoes? This recipe looks easy and delish! ⇒ This recipe will definitely be a hit for my girls’ school lunchboxes, and I’ll be making double to have at home too! How is back to school season going for you? Ohh! I am checking out those kitchen hacks!! I could always use some! They are awesome! My fave in the series thus far! You’re most welcome Linda! Thank you for sharing!